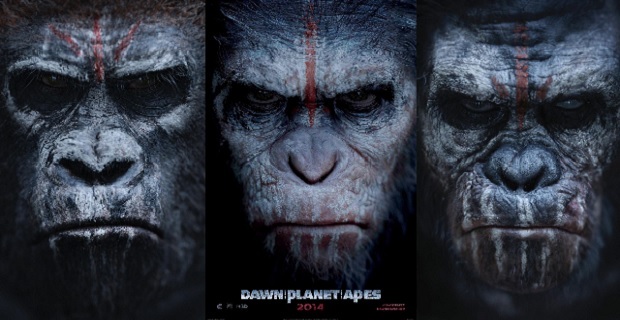 THE APES ARE back, and Gary Oldman is with them. Or is he? Sometimes it’s hard to tell with these artistic types, especially actors. They’re so good at slipping into and out of identities that it gets…Well, it gets a little confusing trying to figure out who they really are. As for Oldman’s latest fictional persona—Dreyfus in Dawn of the Planet of the Apes—it’s easy enough to say who he’s with. And the apes, it ain’t. The latest in a long line of humans bent on destroying those damn, dirty hominidae non gratae, Dreyfus has his justification—the apes want to kill him (and us!). In this, he reminds you a little of a Republican border governor trying to rationalize his deployment of mortars, tanks, and machine gun nests to stop a bunch of children from crossing the border. He sneers. He pouts. He schemes. He only makes sense if you’ve lost fifty IQ points to desert heat and another thirty to cheap beer. But, in the end, Dreyfus does what you might expect of a villain in a Hollywood blockbuster (or a Republican border governor). He engineers a crisis to destroy any chance the hero (Jason Clarke) has of making peace, killing himself (and just about everyone else) in the process. Excoriation came quickly, as it does on social media. Not even a day later, Oldman was apologizing to new national adjudicator of celebrity sorrow, Jimmy Kimmel, and the question become whether the Oldster’s mea culpa was sincere or not. Most people said, “No,” and those who chose “Yes” seemed to want to change the question almost immediately, to make the issue whether the apology had even been necessary. They did their best to invoke the dystopian fictions of the mid-20th century, complaining about things like “speech police” and “thought crimes.” They talked about manners and freedom. They wanted people to “take a joke,” just as Oldman had. This is an old discussion in America, one I’ve been having my whole life, one that will continue long after anyone alive today is gone. The tone of the discussion has changed, though, gone from one of annoyance to what’s beginning to sound like real fear. The shrinking majority laments its loss of power, and some of its more vocal, less reasonable members seek to reassert that power by re-establishing their ability to say whatever they want. The trick is that they don’t want to let anyone else complain about what they say. The implication is clear: I want my speech, but I could care less about yours. Basically, what Oldman and his defenders want is to be able to act like jerks and get away with it. They won’t come out and say this. I mean, how convincing would “I want to act like a jerk and get away with it” really be? But what these guys can’t take is disagreement, the fact that anyone would deign to call them on what was once their right, to say whatever they want and silence anyone who dissents. The truth is that these guys don’t need the speech police. They need the irony police, because someone or something has obviously heisted their ability to recognize it even in the most rudimentary form. Fortunately, I’ve been able to come up with a reasonable explanation for this whole situation. Owing to my vast network of high-powered connections in the film industry (I know this guy named Dave who worked as a key grip on a student film once), I’ve learned that there was another project filmed simultaneously with Dawn of the Planet of the Apes. The second film, entitled Dawn of Irony on the Planet of the Apes, is scheduled for a Christmas ’16 release. In Dawn of Irony…, Oldman’s back playing a way-overgrown bonobo, the quasi-Promethean Ironicus Chimpspeare. A pot smoking, sunglass wearing, traveling thespian, Chimpspeare delivers the gift of irony to the residents of Ape City. As it goes with quasi-Promethean figures, and the vast majority of actors, things don’t work out well for our hero chimp. Soon, the predictably bloodthirsty leaders of Ape City are doing everything they can to co-opt Chimpspeare (and irony) to their nefarious simian purposes. First, they build a soft PR campaign around the humans’ supposed theft of Chimpspeare’s masterpiece, Chimplet. Later, they fake an assassination attempt, using this as pretext to begin a war of genocide against the remaining humans. Chimpspeare is the only one who can stop them. He fails, of course, beginning the apes’ long devolutionary slide back towards humanity, a cinematic skid that’ll take at least three more movies to play out. According to my buddy Dave the one-time key grip, Oldman is sensational in the role, bound to get heavy Oscar consideration. This may sound far-fetched, but give it a little thought. You’ll realize this is the only explanation that makes sense. How else could a bunch of old white guys complain about free speech even as they try to limit everyone else’s? And who knows, maybe this can help us understand what’s going on in Texas, too. Maybe Rick Perry’s lost his sense of irony just like Gary Oldman. Maybe that’s how he can bring himself to grandstand on illegal immigration even as his campaign coffers fill with profits from it.